Our Gibraltar cruise port guide provides information about the docking location of cruise ships, cruise terminal facilities, transportation options and lots more! 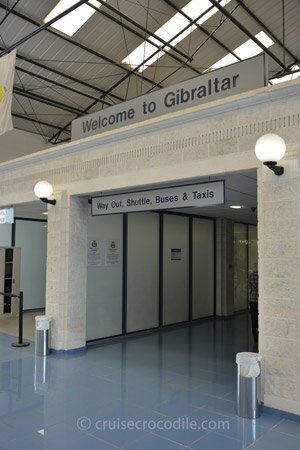 Welcome to the Gibraltar cruise port guide. Gibraltar is a little piece of old England. 30.000 people live on 6km2 with a 1400 ft high rock on it. This is what makes up iconic Gibraltar. It represents the pillars of Hercules, the entrance to the Mediterranean sea, the key location for commerce and war and the last remaining colony in Europe. So you could imagine it is an important piece of land that is desired by many. Gibraltar is a British overseas territory. Since 1704 this tiny piece of land has been under British rule and if it is up to the British this isn’t going to change any time soon. Britain will never leave it and Spain will never forget. Nowadays is known amongst many as the best holiday destination for the Brits and other nationalities. Gibraltar might be small but there is plenty to see. The nature reserve, airport, moorish castle, light houses, casemates square and tons of locations that tell you the history of Gibraltar. There is something to see and do for everybody. The dock is called North Mole. This is usually where cruise ships dock. 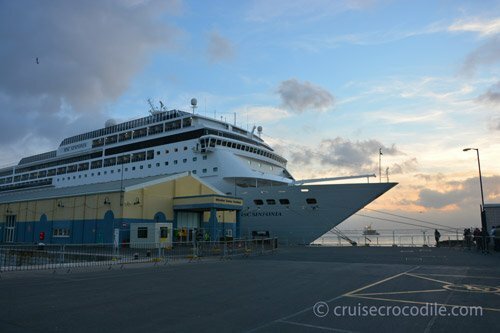 This cruise terminal is situated at the North Mole terminal that is about 1,5 km away from the main square. From the cruise terminal you can already see the rock itself. Inside the terminal you’ll find some facilities like tourist information, a taxi information desk and souvenir shops. If your ship doesn’t provide a shuttle bus, find this sign in front of the terminal to hop on the local shuttle bus. Cruise ships dock at Gibraltar’s North Mole. At this point there are only 2 options where the cruise ships can dock. This pier is called North Mole. From here it is approximately 1 mile / 1,5 km walk to get to Gibraltar’s main square. The cruise terminal itself offers all necessary services: tourist information, taxi booking desk, souvenir shop etc. There are a couple of options when leaving the cruise terminal building of how to get around. If you just want to shop in town either take the shuttle bus or walk to the main street. Find out underneath what forms of transportation is usually offered in port. Usually the port offers a shuttle service from the port to Casemates square (main square) which is normally a 25 minute walk. Find the stop right outside the cruise terminal building underneath the sign “Shuttle”. Cost is 3 euro one way / 4 euro both ways. 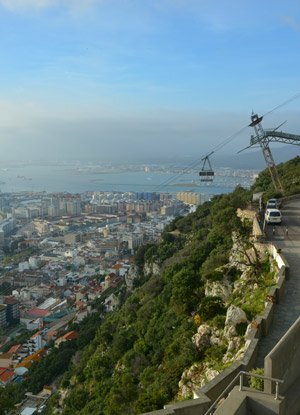 Although Gibraltar has an effective public transportation system there is no public transportation offered at the cruise port. The first available bus stop is about 1 km walk. Find it at the first round about when walking away from the port area. Keep in mind public transportation is not allowed in the Upper Rock Reserve. However it offers a convenient way of visiting to the border, the cable car and Europe point. Pay the bus driver directly, he takes pounds and euros. There are plenty taxis waiting when you exit the cruise terminal. 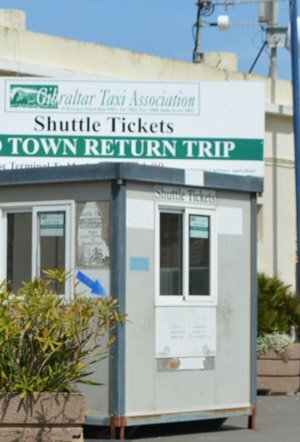 You can book a taxi through the taxi booking desk in the terminal or if the desk is closed, just walk outside and deal with the taxis personally. The taxis advertise they have 2 different tours: – The standard tour that includes 4 stops: The great siege tunnels, views from Upper Rock and Apes, St. Michael’s cave and the Pillars of Hercules. It takes 1,5 hours and this would cost 12 pound per person, entrance tickets are not included in the price. – The extended tour that includes 6 stops: The Great Siege tunnels, Moorish Castle, Views from Upper Rock and Apes, St. Michael’s cave, 100 Ton Gun and Europe Point. This takes 2 hours and 15 minutes and should cost 20 pound per person, entrance tickets are not included in the price. Keep in mind that you will probably be booked on a mini van that will take your fellow guests with it at the same time. Minimum is 4 people. – What is the difference between Brittish pounds and Gibraltar pounds? Except for their appearance nothing. There is no difference. They both fall under the Great Brittish Pounds. Therefore The Brittish, Scottish and Gibraltar pound are the same and all should be accepted everywhere in Gibraltar and the UK, althouhg in theory this sometimes is not the case. – Do they accept euro of dollars in Gibraltar. Euro they accept in most places. Dollars is usually not accepted. Mastercard and Visa you can use widely ikn Gibraltar. 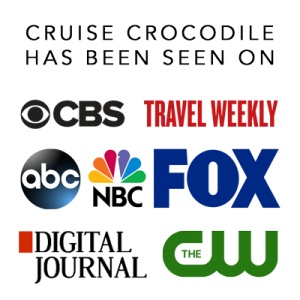 – What is better: ships tour or taxi tour. It is up to you! Can’t decide that for you. – Are the apes dangerous? No, generally not. Although there are cases were visitors are bitten by them and need to go to the hospital. Be carefull with the apes. They seem cute but remember at all times they are still wild animals. – Can I cross the border over to Spain? It depends on your nationality and itinerary, but in general if the political situation is stable it should not be a problem. – Can I go to Morocco for the day? We will never recommend to do this. Accessible facilities Facilities for people with a disability. Please find a list underneath with information about wheelchair accessibility: On the Upper Rock Nature Reserve: – St Michael’s Cave – the cave is partly accessible – Apes den – accessible – Great Siege Tunnels – half of the tunnels are not accessible – Moorish castle – access difficult, steps and narrow corridors Other attractions: – World War II Rock and Fortress tunnel tour: is accessible – Gibraltar Museum: provides access to ground floor only – Cable car: not accessible – Alameda botanical gardens: Accessible – Shrine of our lady of Europe: has good access. Public toilet facilties for disabled users you can find at: Casemates square, Line Wall Road, Alameda Garden, Great Siege Tunnels, Catalan Bay, Ocean village and John Mackintosh Hall. For more information contact the Gibraltar Tourist Information. There is no wi-fi in or around the cruise terminal. You’ll have to go to the city centre to get wi-fi. The best place for it is at casemates square where there are lots of cafe’s that provide wi-fi. This is about 1,5 km / 20 minute walk from the ship to the east. The Bay of Gibraltar is an incredibly busy body of water. Tons of ships lay at anchor to bunker their new oil. From the rock you are going to have brilliant views over the bay with all its ships at anchor. At Europe Point you’ll also find this beautiful mosque. This building was a gift from King Fahd of Saudi Arabia. A small gift of 5 million pound. It officially opened in 1997. From port it is 7 km / 15 min. drive to the south. Cruise ships will dock at the Gibraltar cruise terminal. From here you are it is about a 25 minute walk to the main square of Gibraltar. 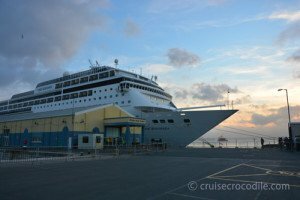 At the cruise terminal you will find tourist information, shuttle service, taxi stand and a souvenir shop. Read the full Gibraltar cruise port guide for all the information on this port. Gibraltar is not the best beach destination. Most of the beaches are on the east side of the rock and thus in the shadow in the afternoon. Therefore focus on the sightseeing will be more worth it. The main street is the pedestrian street that no visitor of the town should miss. It proudly displays a arrangement of buildings that shows the multicultural history. Spanish, Victorian, British colonial and Portuguese style stand side by side together with 12 different religions. Although the most important thing to say about Main Street: it the largest shopping street in Gibraltar where you’ll find the duty free shops. From port it is 1,5 km / 20 min. walk to the east. Roy’s famous fish and chips: This tiny establishment on the main square claims to have the best fish and chips of Gibraltar. Why not give it a try. From port the main square (Casemates square) is about 1,5 km / 20 min walk to the east. The Upper Rock is the most recognisable rock of Europe. It is a protected park known for many things. In terms of wildlife look out for: Barbary Partridge, Wild Olive, Stone Pine, Yellow-legged Gull, Peregrine, Moorish Gecko, Gibraltar Funnelweb and Lesser Kestrel. In addition there are over 600 species of plant and over 300 species of birds. Get up the Upper Rock by foot, taxi or cable car. The most famous cemetry of Gibraltar. The tombstones in the cemetry commemorate the dead of 3 yellow fever epidemics in the 19th century. Here you’ll also find the victims of sea battles of the Napoleontic wars. From port it is 2,5 km / 30 min. walk to the south. This Cable Car from 1966 is also a way to get up to the Rock. It takes you 412 meters above sea level. The views from the top are impressive. Expect there can be long lines for the cable bar. From port it is 3 km / 40 min walk tot he south.